Doggedly determined to do (and enjoy) all those things I always swore I would do if I wasn’t sitting at my desk at 7a I slept in, albeit waking up at 6:30a on the dot and smugly noticing that the “on” button on my alarm clock was humbly dark. I lounged in bed in my PJs. I ate toffee for breakfast. I watched two (two!) episodes of The Office and I even thought they were funny. I made it until 12:15p. And then, I couldn’t take it anymore. I leapt out of bed, cleaned the house, tidied up the kitchen, walked the dog in the pouring ran (the long loop! ), picked up cupcakes for book club, and began organizing my closets. Looks like I’ve got a ways to go until I reach that highly enlightened and peaceful state. In the meantime though, there’s always pasta. 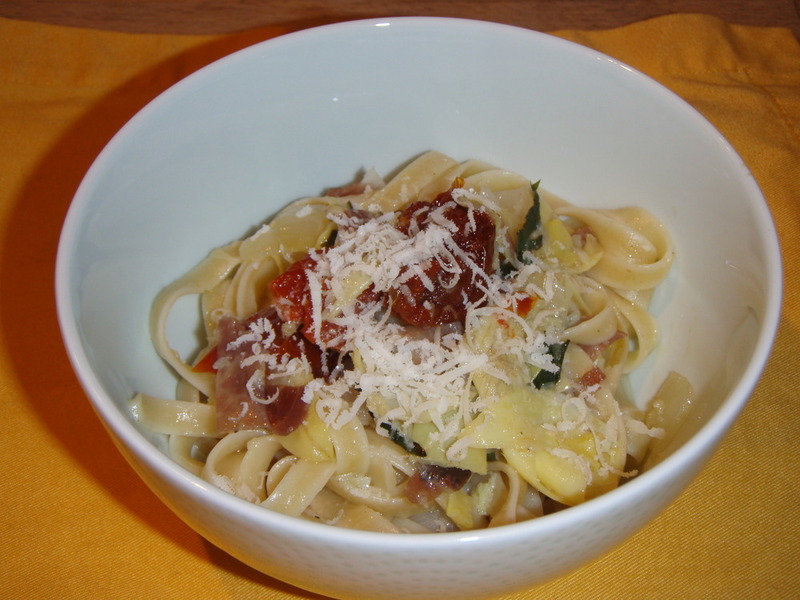 This is very simple, quite yummy, and adapts well to being a base from which you can throw random leftovers into and use them up. Make it on a rainy Thursday when you realize it might take more work than you thought to slow down. In a large non-stick skillet, add four TB olive oil over medium-low heat. Add the onion and garlic and cook until softened, stirring occasionally, about 5 minutes. Add the artichokes, season with salt and pepper, and cook until artichokes are softened and fully blended, stirring occasionally, about 10 minutes. Meanwhile, bring large pot of water to a boil and cook fettuccine according to directions. Reserve 1/4 cup pasta water before draining. 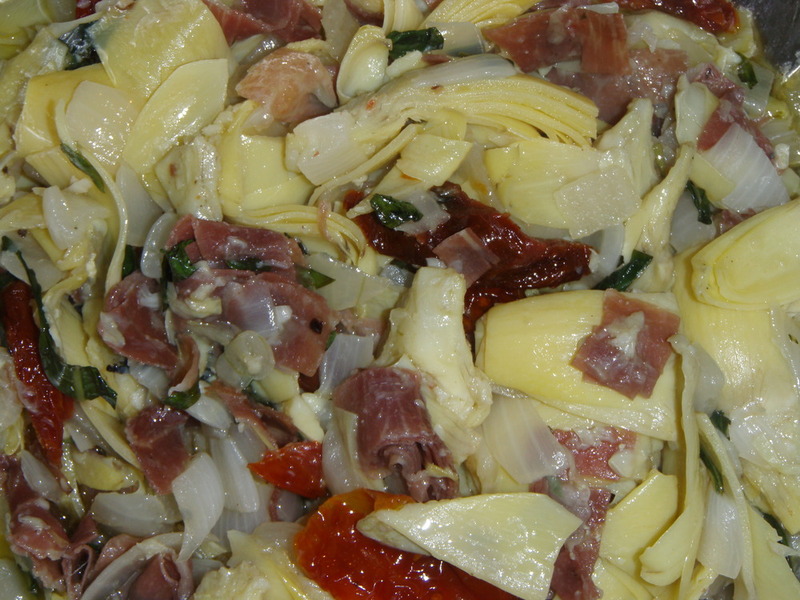 Add the basil, prosciutto, sun-dried tomatoes, and remaining four TB olive oil. Stir well and reduce heat to low, stirring occasionally, about another 5 minutes. 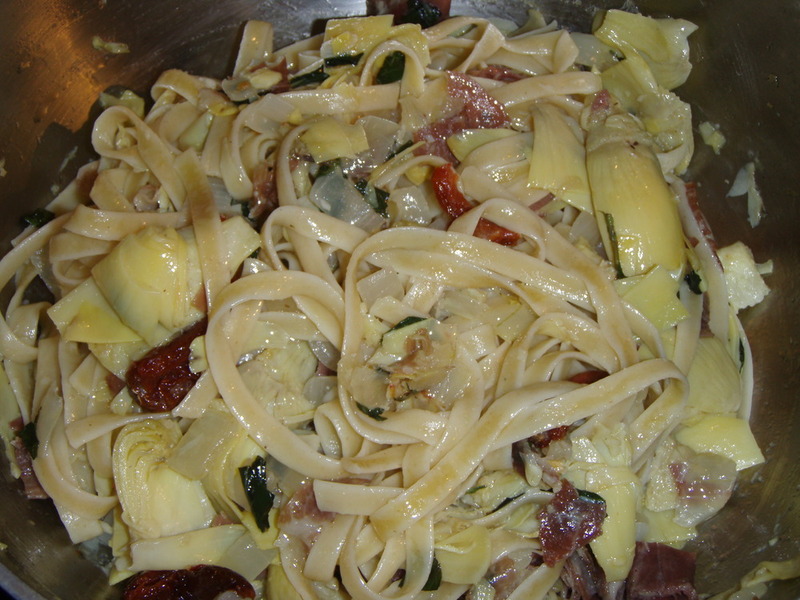 Add the artichoke mixture and pasta water to the cooked fettuccine and toss well. Like all things, this is better with a bit of cream, so if using that add now and toss to combine. 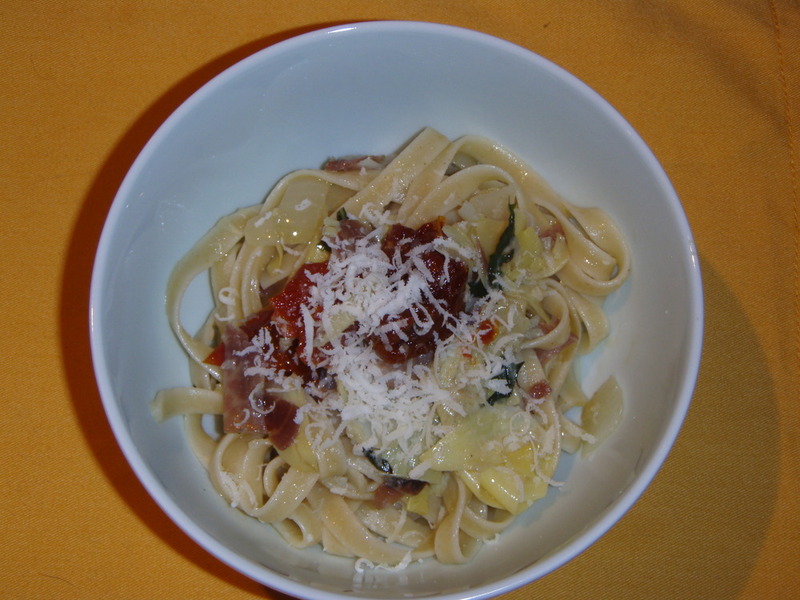 Top with black pepper and freshly grated Parmesan.